Until quite recently it seems, it has been relatively easy to find a wide range of Anchor Threads in Italy. In 1904 J & P Coats acquired the Italian thread manufacturer Fabbriche Italianne Filati Cucirini which became Cucirini Cantoni Coats. Production was very successful and at the beginning of World War I they had 1000 employees. In 1931 Cucirini Cantoni Coats acquired Industrie Sete Cucirine and became the market leader with their brand "Tre Cerche" [three circles]. In 1993 the company name changed to Coats Cucirini. They have become quite diversified from the early days and now produce and/or distribute products for clothing, footwear and leatherwear as well as threads, zippers and every kind of craft supply and accessory. Their head office is in Milan but the thread has been manufactured just outside of Lucca for over a hundred years. Rumours of imminent bankruptcy have dogged the company for the past few years. Last year there was some pretty strange colour changes in their pearl cotton line exclusive to Italy called: Ritorto Fiorentino, causing speculation that they were having the threads dyed in Asia. They have undergone some massive restructuring and I assume "closure of the Italian production site with delocalization of supplies" means the manufacturing plant in Lucca but don't quote me on that, I'm speculating too. I have been told by a reliable source however, that some of the thread manufacturing is now done in Hungary. They have reduced the range of threads in Italy which is all I'm really interested in. 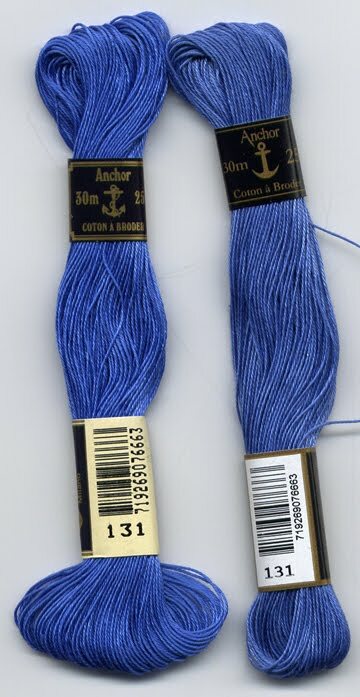 For needle lace there were Coton a Broder numbers like 40, 35, and 30 which were quite easily found... threads which are almost non-existent this side of the Atlantic. Now they are getting harder to find in Italy too. These threads are still listed on their website, but try to find a shop that carries them. Even Coton a Broder number 25 has been vastly reduced in it's colour range. This weight is not that widely known in North America, but there are some stores that carry it at least in white, ecru and black. I never even knew it came in other colours until I went to Italy! Since I'm a thread-a-holic I bought myself every colour available from Italian Needlecrafts when Elena got her Coton a Broder no. 25 stock in mid-May. They arrived today! The top row is Ritorto Fiorentino no. 12, the middle row is Coton a Broder no. 25 and the bottom is Embroidery Floss. The linen is Sotema 20L - 38 count (an absolute dream!! Shhhh! Let's not awaken the linen-a-holic in me!). I did some buttonhole stitches: every two holes and then every one; stem stitches with the thread held to the left, running stitches, lazy-daisy stitches, french knots: one wrap, two wraps and three wraps, cross stitches over two and satin stitches. 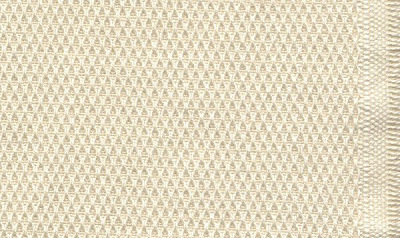 Remember, this is 38ct linen and this kind is quite compact. I did the scan at quite high quality, clicking on it should get you a pretty nice close up. I thought that for this linen (my preferred count) the Coton a Broder no. 25 was the perfect weight. The Ritorto Fiorentino no. 12 was a bit tight and started to look worn really fast and the Embroidery Floss didn't give me the coverage I like. What do you think? The label says they are colour-fast. One last thing to note. I already have a skein of Coton a Broder no. 25 - colour no. 131, which I got two years ago. The label says it's made in Italy and the company name is Coats Cucirini, Milan. The skein that arrived today says it's made in Hungary by Coats GmbH, Germany. Hmmmm. This made me check the label of the Anchor Embroidery Floss I have that I got last year from Italy... made in Germany. The Ritorto Fiorentino label says made in Italy by Coats Cucirini but I bought that in 2007. Notice the colour difference? Its more noticeable in real life but the Italian skein is the one on the left, the colour is richer, slightly darker. But I'm happy to get it! My daughter is out for the evening, I'm off to catalogue all those new colours! Oh! I almost forgot... on June 18th there will be a new Punto Antico book available with English and Italian text called: Ciclamino - Oggetti a Punto Antico di Bruna Gubbini. Projects will be smaller items than before. Watch this website for more info! I really like Italian tassels. They are exquisite. 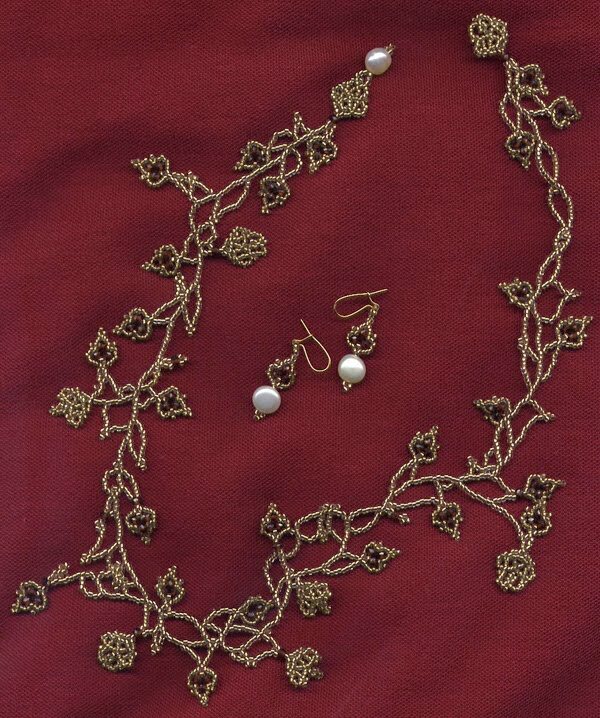 From the more elaborate to the very simple, they have a style all their own. Some of them are very easy to make. Vima deMarchi Micheli wrote a lovely little book called: Tassels Italian Style which is full of ideas and very clear instructions. The Anchor Manual of Needlework (Interweave Press) has a few in the second to last chapter: "Finishings and Decorations for Embroidery". 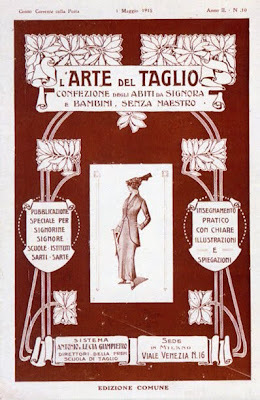 My most recent acquisition on tassels is the book: Nappe e Pendagli by Giuseppa Federici of San Paolo di Jesi, Italy. The book has 15 different tassels explained from start to finish with lots of clear diagrams though the text is in Italian. You can get this book from Tombolo Disegni - its under the "Libri" section, then "Libri Ricamo Italiani" - send an email request. I recently tried to explain how to make some knotted tassels to a friend and ended up getting my daughter to take some pictures. I followed the instructions from the Anchor Manual of Needlework except that I had seen some tassels in Assisi made of twisted cording and wanted to try that. First things first.... get out your kitchen string or any other thick cotton yarn and your cord-maker (not essential but certainly faster!) - I have the Kreinik Custom Corder but I understand you can use a drill and a hook just as well. Run out a length of 10 feet of kitchen string, fold it in half and tie the two ends together. 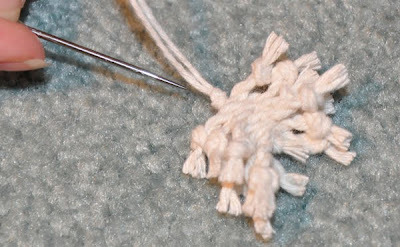 Twist until the length is tight and begins to twist back on itself if folded. Grab the length in the middle and release the two ends to let them twist themselves up into one thick length. You now have a twisted length of cord about 1/3 of your original length. Make knots down the length in a series of about an inch apart, then half an inch apart, then an inch apart, then a half inch and so on. You now have your tassel! You can attach it to the corner of a placemat by inserting the needle into the outer corner point and coming out at the inner hem corner point. Take the needle back down into the outer corner point and make little couching stitches to hold the threads in place (one per thread will do), then needle weave down the length to your tassel head and either bury the thread back in your needle weaving and up into the hem or pierce the centre of the tassel head and make another knot where you come out. Hint: the longer the distance between the knots you cut between, the longer the fuzzies on your tassel. I have seen instructions for just making your initial length full of knots of equal distance apart (for example one inch) and cutting between every second knot. If you get them wet, they fluff up even more. I have made these tassels many times for works of Punto Antico Embroidery or Catherine de'Medici Embroidery. 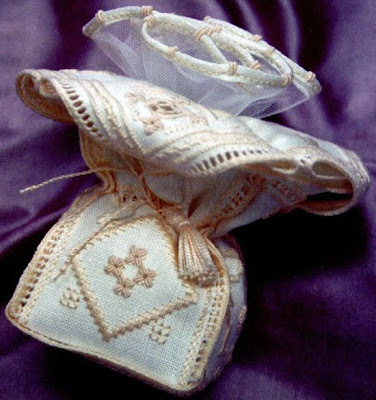 One of the things I wanted most when trying to learn about Italian needlework in the beginning of my research was a kit... I thought a kit would give me a little window into all aspects of a technique. I imagined a little packet with a design, technical instructions, some Italian fabric and threads with the right needle for the embroidery. Italian kits, if you can find them, are, for the most part, not anything like that. Most people I wrote to told me they didn't make kits. Since we're talking about 10 years ago, most people didn't have books about their specialty technique either. No one had any written instructions that they wanted to give out, even if you were willing to pay. When I did find "kits" they consisted mostly of a blurry picture of the finished product, sometimes with a separate drawn design (rarely at actual size), a list of the stitches used and the fabrics and threads recommended (no colours were ever listed precisely either). To be fair, the kits weren't made for going outside of Italy, so it is logical that they wouldn't have details about things Italians would already know, or be able to find out relatively easily. In a time of few websites and even fewer email addresses, this was a slow and often disappointing process for me. Even when I managed to assemble all required materials I then couldn't proceed for lack of instructions. Making things from the magazines was equally disappointing. 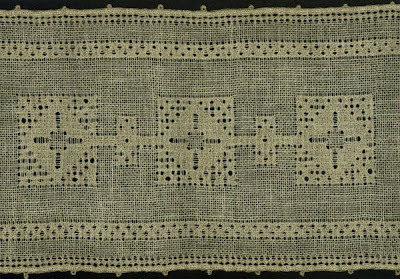 More often than not the stitches weren't explained or only some of the project was, for example the central motif but not the hemstitching. I discovered some essential things necessary for understanding Italian stitching instructions. No one, no one, could understand why I wanted to reproduce an exact replica of a piece. Wouldn't I like to change it a bit to personalize it? It was expected that I would want to change the size, colours, fabric, threads - even the stitches used to make the design my own. I can tell you that when you show "anglosaxon" stitching instructional books and kits to Italians they are amazed at the detail. I believe this to be a fundamental cultural difference and its an important one. I am at my most comfortable and happiest when being instructed on every step... having to make my own decisions (which could be wrong!) is scary to me and I am very reluctant especially when using expensive threads and fabrics that I went to a lot of trouble to acquire. I bought an Italian encyclopedia of embroidery and an English one and started to compare stitches, finding that some of them were the same and just had different names. This helped a lot with things that weren't exactly "Italian" techniques. It's a kit I purchased at the Puncetto booth. The stitched sample was an attractive bracelet of red and blue thread. 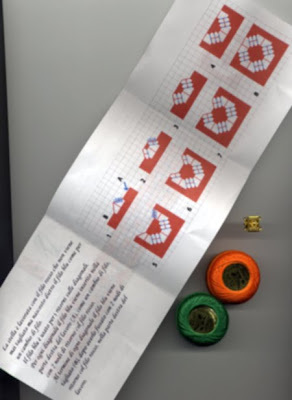 Inside an opaque little bag (not unlike a travel make-up bag) was a colour computer printout of the pattern, with the steps for creating one motif. Nothing about assembly, borders or the filling between motifs and no stitch instructions. There was a fuzzy colour printout of the stitched sample (red and blue) on one side. There were two small balls of Finca no. 12 thread in orange and green and the clasp for the finished bracelet. I don't remember what it cost but I remember thinking that it was expensive, at the same time I bought two books as well with a total cost of 50 euros. Unfortunately neither of the books had instructions either, they were just patterns. Okay, so it is my own fault that I didn't look carefully enough at what I was buying but seriously, I don't think it would have mattered. I would still have bought them all in the hopes of getting home and figuring it out. Here we are three years later and there they sit still waiting for me. Even though by now I've done some experimenting on my own and even taken a two hour lesson and had a friend patiently show me some stitches. Other kits I bought at the Forum that year were: one that had fabric with the traced design on it, a needle and thread and a colour photo of the finished piece. No stitch instructions; One that was a colour printout of a scan of the finished piece with reference to a book written by the same author. I had the book so I wasn't worried... upon arriving home however I saw that the book had the stitches explained but the composition of the kit was no where to be found, meaning I would need to understand enough about the technique in order to assemble the motifs myself; some came with washed out photocopies of stitch instructions; I have not stitched any of them. This is not to say that by Italian standards they are not good kits. They are excellent kits if you already know how to stitch the techniques. Every single one would be useful to someone who knew what they were doing. I guess what I learned was that Italian kits are not for beginners and they are not like the kits I am accustomed to in my "anglosaxon" world. You can't see in the scan here but there are even English instructions below the Italian... comprehensible English! 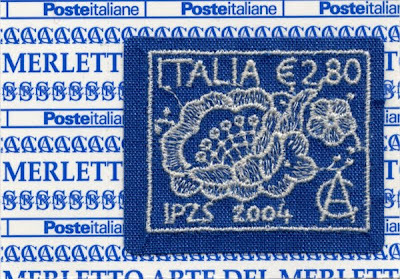 Just lately there has been some interest in producing Italian kits for the non-Italian needlework world. 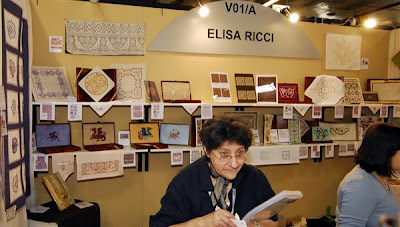 These kits, produced by Fiorella Collection, will be on Italian needlework techniques or techniques with an Italian flavour. The booklets will come in Italian, French and English to start and you'll need to specify the language you want as each booklet is produced separately. In order to make them affordable, they are instructional books without the supplies, however they will be sold online where you can order the supplies needed in most cases. The booklet even has the instructions for executing the picots along the edges! 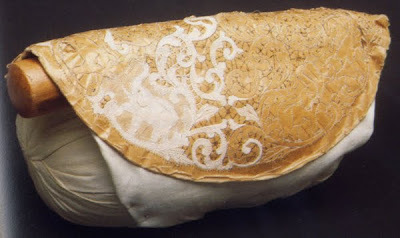 This work is known as Catherine de'Medici Embroidery and it is a Counted Thread Technique. The design is by Rosalba Pepi from the Laboratorio Tessile di Alice in Castiglion Fiorentino, Italy. They are the closest thing to what I dreamed of long ago - made by the Italian needlework schools and masters. I hope they catch on as they will be perfect for giving us a little taste of the numerous different Italian needlework techniques. 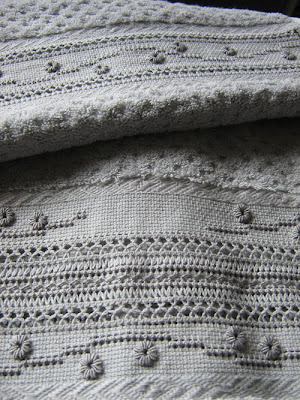 You can get the two Fiorella Collection booklets already available from Elena at Italian Needlecrafts. 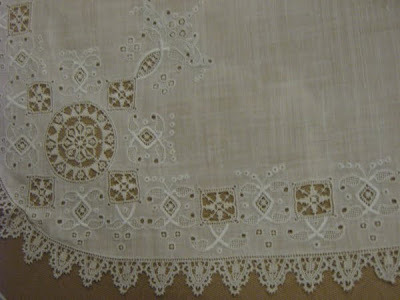 I never get tired of looking at Sicilian Drawn-Thread Work, especially the style called '500 or Cinquecento. I am probably (once again) attracted by the texture of it as much as the motifs. Strange animals are the things I delight in the most and there are plenty of monsters in Sicilian Drawn-Thread Work - especially sea creatures. The work is done by cutting out the design, then building the surrounding netting and overcasting the edges. This must be done in an embroidery frame and the fabric must be on the straight of the grain and drum tight. I took a two-hour class and only got a small heart done but I have to tell you, I've never seen anyone stretch and pull fabric like I saw our teacher do to get it as taut as possible in the frame. I'll never handle my own stitching with care again... linen fabric is strong! The fabric must be tight and not move because you actually cut the threads first and then overcast them so they can't be moving around at all. We basted our linen to a big piece of muslin first and then cut out a centre square window of the muslin so that the linen could be worked on. Tiny stitches overcast three ground threads using one or two padding threads. I kept forgetting to breathe while I was stitching! I was waiting for the ground threads to work their way out of the overcasting but they didn't. We didn't get to do any of the netting in class but I have made netting on fabric before so that was okay. ... okay, without the drawn design to distract me I feel better... maybe I can figure out what to do. This lady does some amazing work, don't forget to click on "vai alla pag. 2" at the bottom of the page for more pictures! I would love to have this tablecloth (middle picture - click on it for a closer look). There are lots of things to look at here and even a video of a display of embroideries. There is an article on Tuttoricamo with some instructions on how the different styles are executed. The Anchor Manual of Needlework (Interweave Press) has a bit of information. Elisa Ricci's Old Italian Lace has some great photos of antique works, you can download it at the Online Digital Archive. 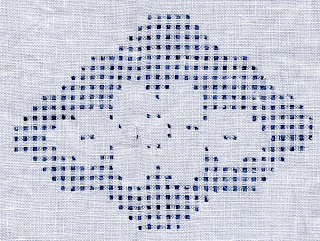 In the years before the Second World War three sisters named Nella, Mimi and Marta Sammartini devised an embroidery technique which they named after the area where they lived. The Piave Valley Region lies a bit north of Venice, Italy. Piave Embroidery is executed on Tulle with diagonal Darning Stitches, Padded Satin Stitches, Rush Stitch and other embroidery and filling stitches and then applied, using Overcast Stitch and Stem Stitch to the backside of Organdy fabric, the very finest transparent cotton. Excess Tulle is cut away around the embroidery and often areas inside the embroidery too. Sometimes secondary layers of Organdy are applied as well to create varying levels of transparency. It is done most often in white on white with 1 to 3 threads of embroidery floss: the incredible transparency of this embroidery makes it perfect for delicate pieces like soft, gauzy curtains, overdresses, veils, and tablecloths. In the late 20th century this lost technique was reborn and brought to life by Silvana De Marchi working with Luisa Cigagna, Doretta Davanzo Poli, Tudy Sammartini, and other descendants of the Sammartini sisters. 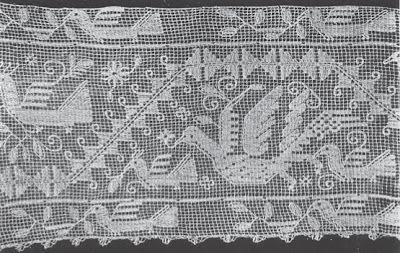 Antique pieces of Piave Embroidery were recovered from the homes of descendants and used to inspire new designs. 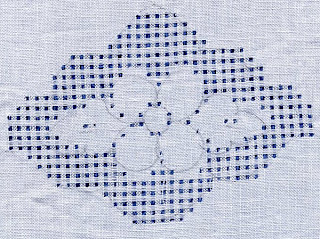 Tudy Sammartini remembers her aunts recounting that Marta would design the patterns and Mimi and Nella would embroider them. Ricamo Italiano, an Italian embroidery magazine, ran a story on the rediscovery of the technique along with modern interpretations which used old designs with coloured embroidery floss in their June 2006 edition. RAKAM, another Italian embroidery magazine, ran a series of photos of several pieces from the 1930s in their March 2008 issue. Instructions can also be found in old issues of the Italian needlework magazine Fili: specifically no. 28 from 1936 and no. 37 from 1937. 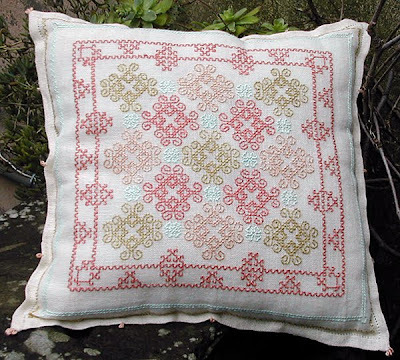 Tuttoricamo has a brief article under "Techniques" on their website with a link to a free downloadable pattern from the Italian embroidery magazine Ricamo Italiano. 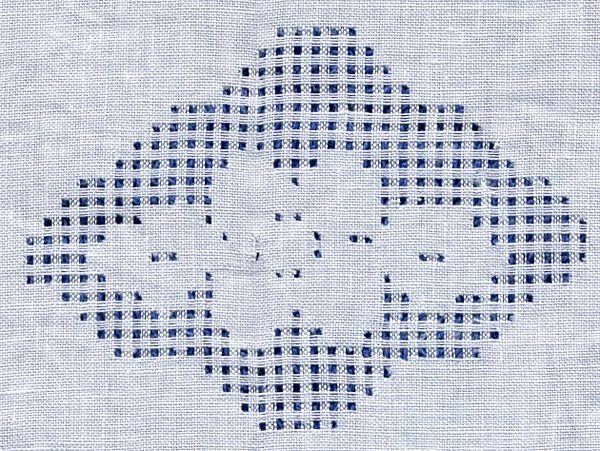 There are a few pages in the Anchor Manual of Needlework (Interweave Press) on Piave Embroidery. 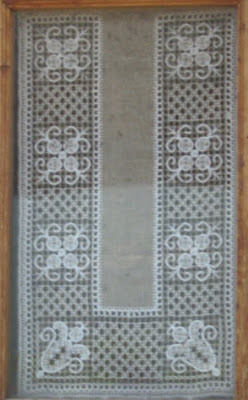 The major difference between Sardinian Bosa Filet Lace and the Filet Lace that is common in other countries are the motifs and the heavier use of the Linen Stitch (or Cloth Stitch) and the Double Running Stitch used to outline motifs such as flowers, leaves and vines. Together with the Darning Stitch and Dove's Eyes these stitches make far more interesting Filet Lace, both to admire and to make. Bosa is a small town in the north-western part of Sardinia in Italy. 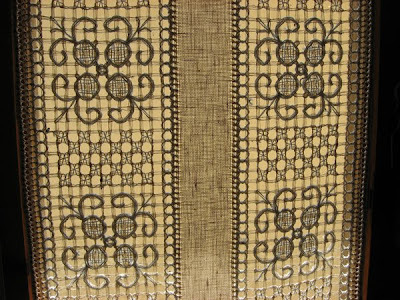 Historically embroidered on both ancient Buratto woven linen or Modano knotted netting, today Sardinian Bosa Filet Lace is done almost exclusively on the Modano knotted netting. 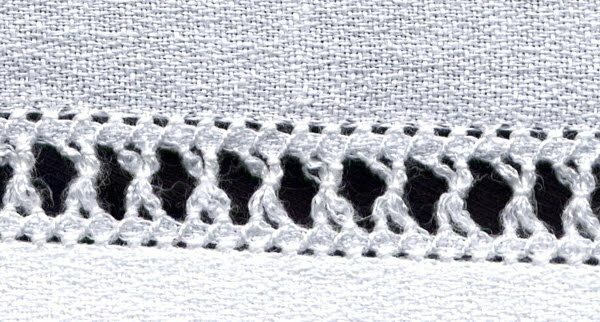 Two variations on the Linen Stitch, the Darning Stitch, the Dove's Eye Stitch, edge finishing and frame mounting instructions can be found here in Italian but the diagrams are clear. How to execute a flower and some rings can be found here: click on the various circles in the photo, this will take you to a close-up photo of that particular stitch and then to the right click on the word: "qui" which is underlined to go to a series of photos of how to execute that particular stitch. 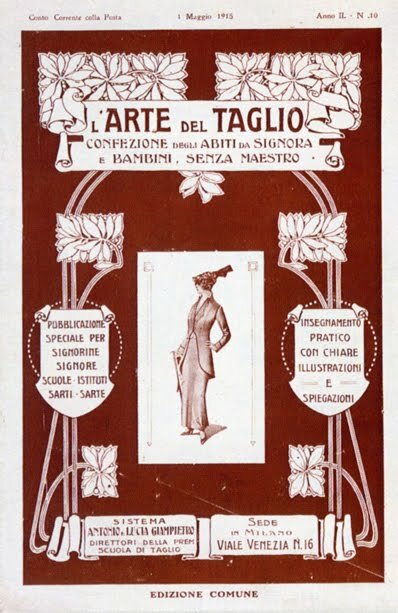 At the Sardinian Digital Library you can download a book called Arte Sarda - there are many photos of Bosa Filet Lace starting with Chapter Four on page 246 of the pdf. Visit Tuttoricamo and under the "Techniques" heading you'll find an article called "Filet and Bosa Filet" which has lots of links to pictures. 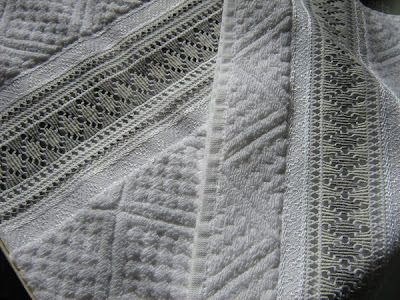 While you're there you can read about ancient Buratto woven linen under the "Materials" heading. Learn about Elisa Ricci in the "Prominent Characters" section. Thanks to Stefania for the museum photo! Reticello is another one of my fascinations... I really like the chiaroscuro of the filled and unfilled areas. I'm always drawn to it and have many books on the subject. My own attempts have been relatively successful though no where near the perfection of true Italian masters. Handkerchiefs are a nice way to collect samples of different techniques, if you can find them reasonably priced in antiques markets. I am stunned by the amount of work that has gone into artifacts which are so small. 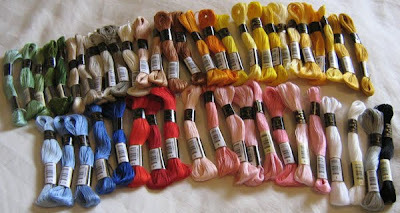 You need really fine thread to work these, good eyesight and lots of patience! 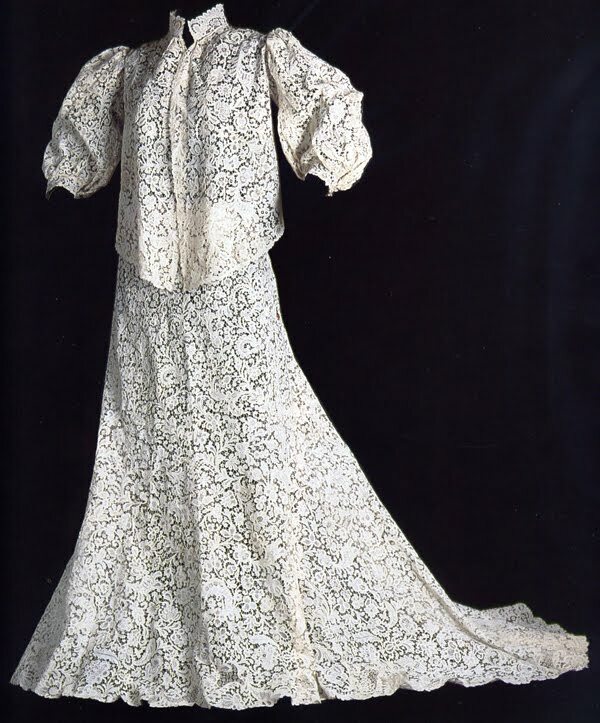 In October of 1987 the Palazzo Davanzati in Florence published a catalogue of some of its collection of laces and embroideries which had been donated by various Italian collectors. 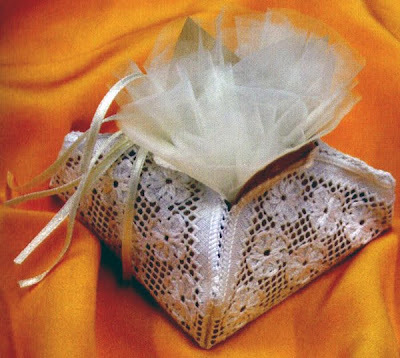 In this catalogue is a section on the collection of mostly handkerchiefs donated to the museum in 1986 by the Duchess Franca di Grazzano Visconti di Modrone (1905 - 2003). The catalogue information says that it is made of Batiste and embroidered in Reticello and Rodi Stitch (inside the bigger leaves), Padded Satin Stitch, Tailor's Buttonhole Stitch and "Cordonetto" (I don't know what that is referring to) finished around the edge with needle lace. It measures 37 x 37 cm and all the corners are rounded and in one, above the motif, sits the coat of arms of the Viviani della Robbia family, the Duchess's maiden name, topped with a marquis crown. 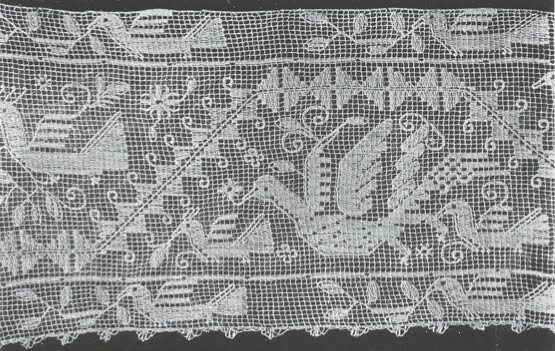 It is an excellent example of Drawn-thread work and Cutwork and is dated the first quarter of the 20th century. The square Reticello motifs are worked into the fabric, not inserted - can you even think about working Cutwork and Drawn-Thread work on this fine of fabric?! I'm sorry my photos are a bit blurry, I was leaning overtop of the open drawer which was at shin-level. Though all the catalogue photos are black and white, there are many, many fine examples of embroidered and lace-worked handkerchiefs with their relative information (in Italian). The section on the Duchess's handkerchiefs is one of three; the others are Lace and Embroideries from the 18th and 19th centuries and Lace and Embroidered Baptismal and Newborn artifacts which includes an exquisite collection of bonnets. The catalogue can be found in used bookstores online, it is called: Eleganza e civetterie: merletti e ricami a Palazzo Davanzati, 1987, Marina Carmignani. If you are looking for a book on handkerchiefs with a more Italian flavour, The Handkerchief by Paolo Peri, 1992, is in English and has mostly Italian examples with particular attention to the 20th century. It has lots of good historical information, there are many colour photos and examples of handkerchiefs in art. In the "History" section of Tuttoricamo's website there is an excellent article called: Handkerchief, a protagonist in decline. There are also two great how-to articles on Reticello in the "How its done" section. Sardinia has a long and interesting history. It is a place that fascinated me as a child. The rocky terrain and the incredible colour of the sea surrounding it enchanted my imagination and whenever my friends and I played "Prince Valiant", I was always a princess from the Kingdom of Sardinia dressed in native traditional costume. Don't ask me where I got these ideas or why they sparked my interest, all I know is, it has always been a place I have wanted to visit. So far I have never been able to organize a trip, but I am determined to get there eventually. ...gold embroidery on bodices, skirt flounces, sleeves, whitework on shirts and blouses - its everywhere! 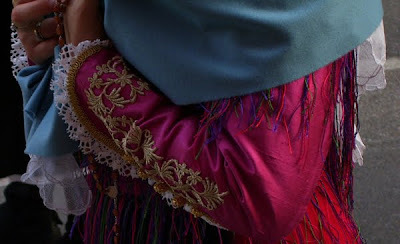 You can see some traditional costumes here during a parade in Sant'Antioco, Sardinia in 2007. A feast is held 15 days after Easter and people arrive from all over the island. 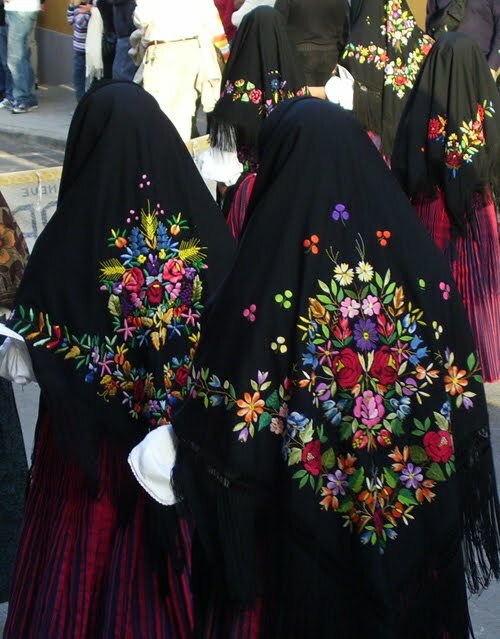 It is a great chance to see many traditional costumes which vary from place to place. 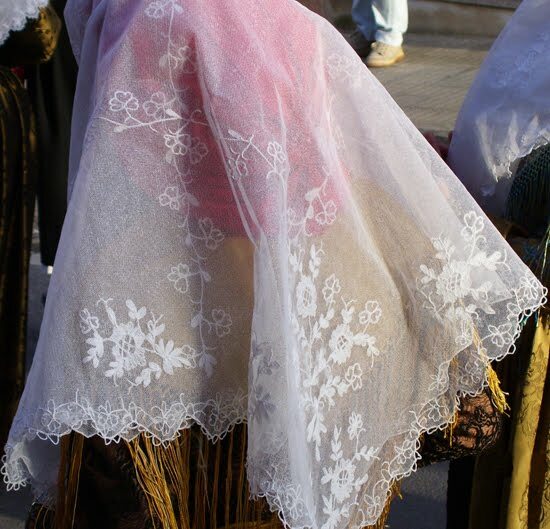 You can download a book on Sardinia's traditional costumes at the Sardinian Digital Library website. While the text is in Italian, it is loaded with photos and art depicting the costumes of the island. For more information and lots of pictures, go to Tuttoricamo and look under the "Techniques" heading and the "Travels" heading. Thanks to Renata for the pictures! 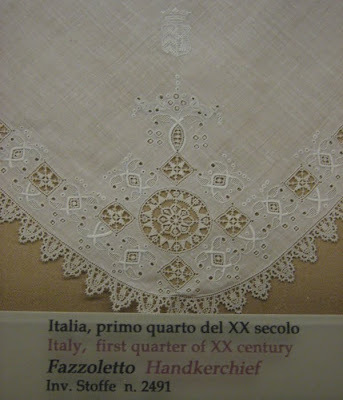 One of the biggest differences between Italian needlework and that which we do at least here in North America is that lots of Italians still decorate household linens and use them daily. 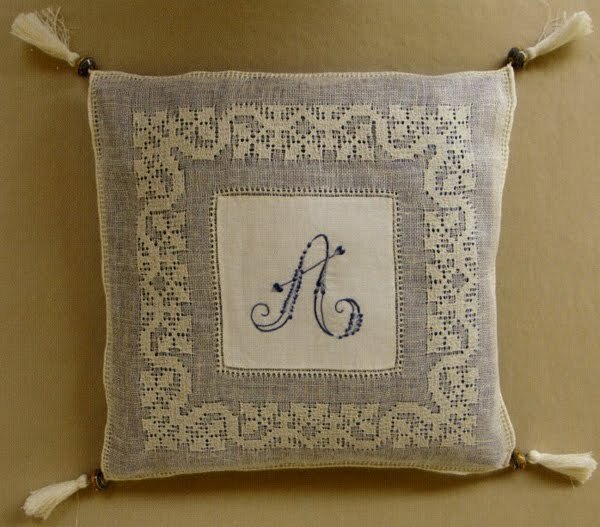 I don't know about where you are, but around here if any needlework gets done or is on display, its usually in a frame for placing on the wall. I really love what I call 'guest towels' (probably because at my house when I was little, they were only put out if we had house guests- which was rare!) or decorative hand towels are still relatively common. Often in Italy hand towels are done on extremely high count linen, with lots of hemstitching or whitework on them, but I've seen lots of coloured embroidery too. I did all the hemming on two hand towels using Ritorto Fiorentino pearl cotton no. 12 and now I search for just the right monogram to stitch on them for my daughter's trousseaux. These are colour photographs though it might not seem so. Elisabetta's incredible sense of colour matching shows in these elegant towels. I have many books on hemstitching as I'm a drawn-thread junkie. Mani di Fata has five booklets with easy-to-follow diagrams on hemstitching called Punti a Giorno in Italian, of varying degrees of difficulty. Though the scant instructions are in Italian, the diagrams say it all. Maria Pia Gaiart has several books on drawn-thread work, these are well diagrammed, some in English and Italian, some only in Italian. You can get these books from Tombolo Disegni. (click on 'Books', then 'Sfilati ed Assia' - you must send an email request to order. 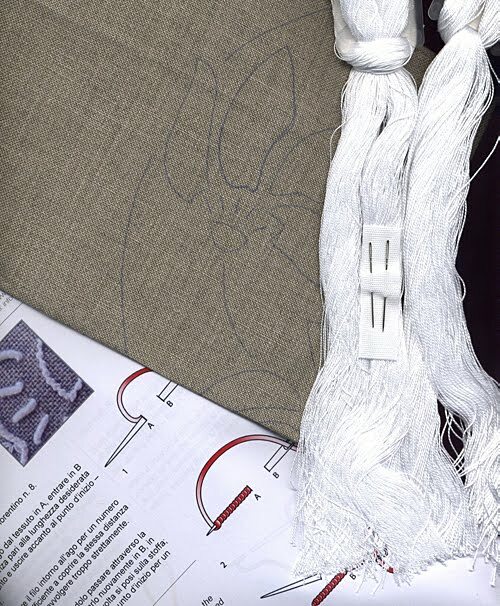 Liliana Babbi Cappelletti has a great new book out on intricate drawn-thread work called Sfilature Legate [Tied Drawn-Thread Work], though the text is in Italian, plans are in the works for an English edition. Her diagrams are excellent and step-by-step, you should be able to figure out the patterns with the Italian version if you can't wait for the English, email Elena at Italian Needlecrafts. There are several tutorials on Tuttoricamo's website under the "How its Done" section. I told you in a previous post about Deruta Pulled Thread work and in that post I also told you that Deruta Drawn Thread work was something different. I will show you the difference here. 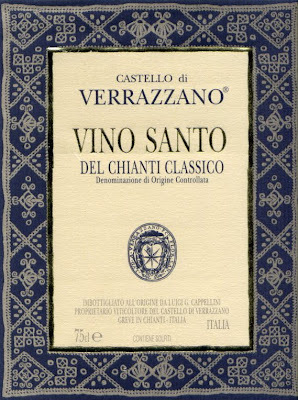 Last year on my tour with Vima deMarchi Micheli we visited the little town of Greve in Chianti in the Tuscany region of Italy where I bought a great woven tea towel with the Chianti region depicted on it from a little shop that sold household linens along the main street of the historic centre. 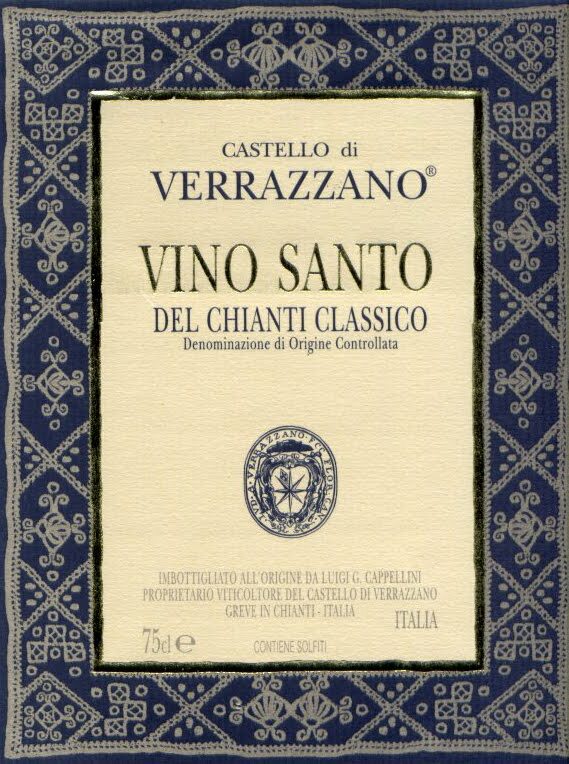 We went on to visit the Castello di Verrazzano in the hills outside of town. To my delight we went into the room where they were. 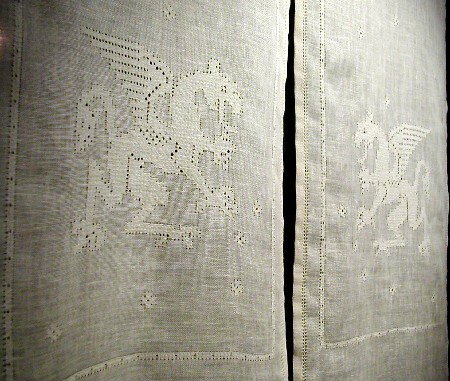 All along the one wall in sets of two were windows, each with the same curtain in this intriguing embroidery. There were six small tassels along the bottom hem which hung down, made of the same linen fibres as the curtains - I wondered if they were made out of the withdrawn threads. I found out later after translating an article for Tuttoricamo on Deruta Drawn Thread work that that was indeed the technique that these curtains were embroidered in. In fact, there was embroidery throughout the Castello... when we entered the dining room to have lunch we noticed that all the curtains there were embroidered in Punto Antico. We said to each other that we'd get photos after lunch but of course after many wine tastings we completely forgot! A few days before, we had dined at the Cantinetta di Verrazzano restaurant in Via dei Tavolini no. 18 in Florence - enjoying the Verrazzano Chianti with Focaccia samplers for lunch. 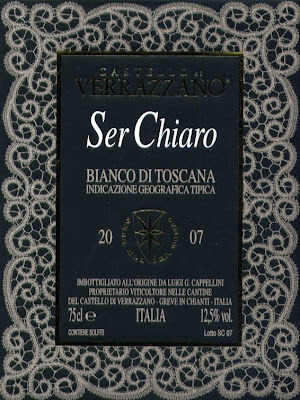 They have Verrazzano wine labels available for those who collect them. I picked up these two because they had photos of needlework on them! To learn more about the history of Deruta Drawn Thread work, look under the 'Techniques' section for an article and more photos on the Tuttoricamo website. There are some close up photos here. Thanks to Armida for the photo of the curtain. There are some websites that I like to get lost in... where I continually find things I haven't seen before, where I see things that make me want to investigate them further and about which I want to learn more. The various websites of Arnaldo Caprai keep me interested in going back again and again. I first discovered the immense textile-related collection of Arnaldo Caprai when I purchased a book many years ago online called: In Viaggio con Penelope. [Travelling with Penelope] This book is actually a catalogue of an exhibition held in Perugia in 1989 of some artifacts from Arnaldo Caprai's collection of over 24,000 pieces of textile-related materials. ...sewing tools like clothing irons and machines, fabric stamps and pretty much any tool related to the textile arts. 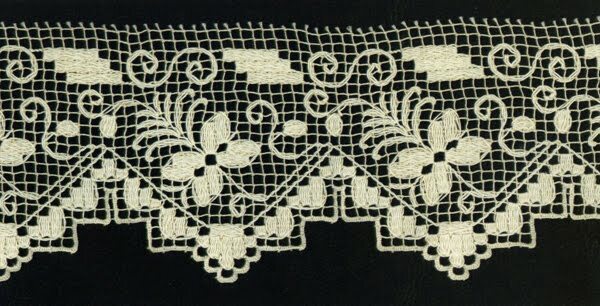 There are photos of embroideries and laces: samplers, table and personal linens, household furnishings, articles for clothing like collars, cuffs, bonnets, trims, etc. Most of the artifacts are Italian but the collection includes pieces from around the world. The Arnaldo Caprai collection has been called "probably the most important private textile collection in the world." The various websites are showcases for not only pictures of some of this collection but also a great source of little bits of information. Pieces range in age from the 8th century up to 1940. The Virtual Museum website has so many pages that even though my Macintosh computer will not permit me to view the virtual rooms, (and anyway I can still read the text even if I can't access the virtual room pictures) I still haven't looked at all the other pages and the website has been online now since 2007. The Study and Research Centre page has a listing of all books and catalogues published from 1980 to 2005. You can find some of these items for sale at used bookstores online. Be aware that they are made of heavy gloss paper and shipping costs can be quite high! The Techniques pages have instructional videos for a "taste" of how the techniques are executed and photos plus lists of other books (not put out by Arnaldo Caprai) for further reading and study of related topics. The Collection pages are broken down further into categories which display photos (you can zoom in really close to see details) and information on many things. Use the search engine on the left to get lost for hours! Not everything is translated into English and some of the slideshows are slow to load but be patient - it's worth it! The Curiosity pages have several mini-articles on things from trousseaux to furnishings to clothing. The Caprai Group pages show you all the other sectors Arnaldo Caprai is involved in like household linens, clothing and even wine. This site in turn takes you to all kinds of other things like along the bottom of the pages: News takes you to more recent events and exhibitions, the Textile Production Process is packed full of each step that textile products go through before being sold. And of course if you want to know more about the man, his businesses, his activities, etc – click on his smiling face! In 2004 Poste Italiane (the Italian Postal service) together with Arnaldo Caprai produced a letter stamp to honour lace. 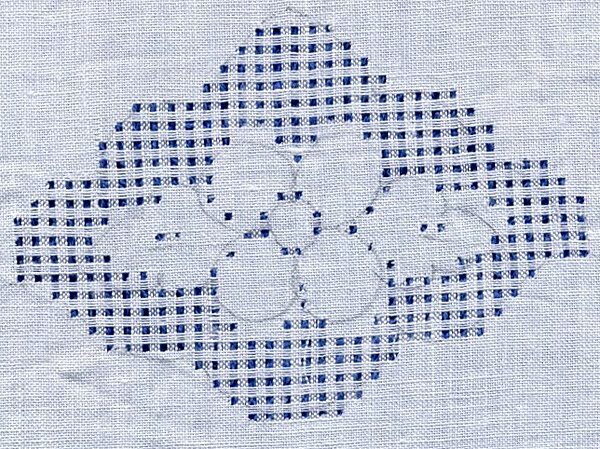 It is a sticky-back fabric stamp worked with machine-embroidery. I have a love-hate relationship with Baroque/Rococo ornament. 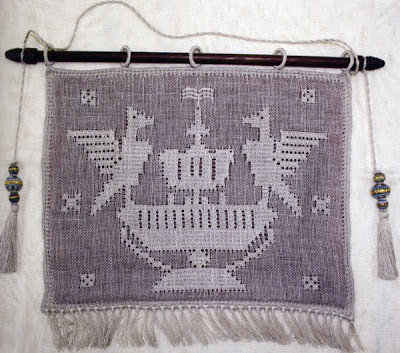 While some things can be (in my opinion) over-decorated with scrolls and fruit and putti, I find I am always attracted to needlework of this period. I think a lot of it has to do with my love of texture. Bandera Embroidery from the Piedmont region of Italy has the same effect on me. Sometimes there is absolutely too much ornament but mostly, if it is tastefully done, I love to look at it. This embroidery style takes its name from the fabric it is stitched on, legend tells that it was first produced in Chieri a small town near Turin at the end of the 16th century. Recent studies however have led scholars to believe the cloth to have Turkish origins and to have already been well-known in the Piedmont region in the latter 15th century. Long before Elena had Italian Needlecrafts in Milan, she hunted down some Bandera fabric and sent it to me. I could not find anything like it around where I live. A lady at a local fabric shop told me to look for Piquet but I never found any of that either, so I can't tell you how similar it is. I believe Elena found it for me at the Canetta store in Milan. 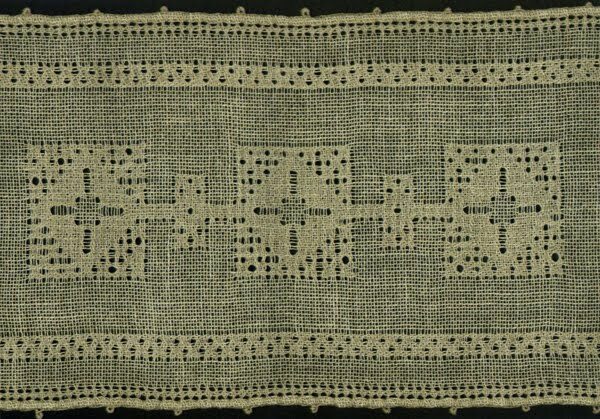 The idea to embroider on this fabric seems to date to the late 17th century, reaching its full height of popularity during the 18th century. Usually done in wool, the embroidery employs the Chain Stitch, Satin Stitch and Padded Satin Stitch, Long and Short Stitch, French Knots and Stem Stitch. Originally executed in one colour of either Savoy Blue or Wine Red, it evolved to include gold-yellow, greens and shades of pink. Wools used recently were DMC Medici Wools but I don't know what they are using now after DMC has discontinued this line. 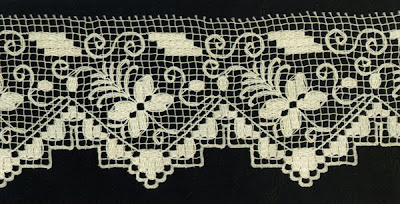 In later centuries the tradition of this embroidery continued, various workshops were opened and products were made such as slip covers for armchairs and sofas, headboard covers for beds, cushions, bedspreads, tablecloths, footstool covers and curtains taking gold medals for excellence in the various World's Fairs of the day and carrying out commissions for the Italian Royal Family. 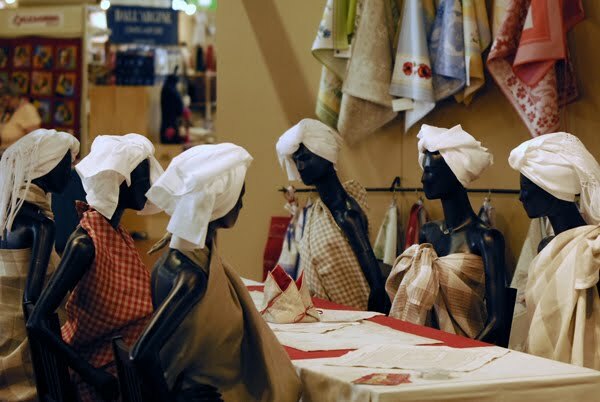 In recent years it has known a revival, many embroidery schools in Italy, particularly in the Piedmont region teach courses and participate in exhibitions. 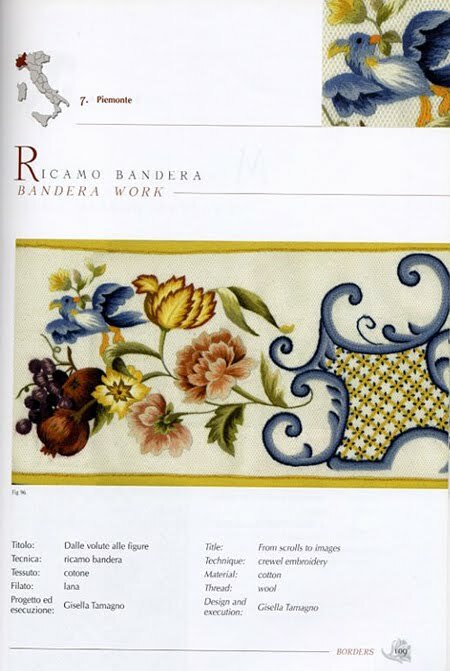 There are often pictures in the Italian embroidery magazines of Bandera Embroidery. There are some photos of Bandera Embroidery at this website, click on "English Version" and then "Bandera Embroidery" (top right corner). Tuttoricamo has more information about Bandera Embroidery under the "Techniques" heading; under the "Prominent Characters" section you can read about Anna Ghigo, President of the Association Amici del Ricamo Bandera of Chieri - check out her beautiful work! La pittura ad ago in Piemonte - Il "Bandera" by Margherita Goglino, 2002. The text is in Italian though at the back of the book are three pages in English, French and Spanish with a bit of a summary. 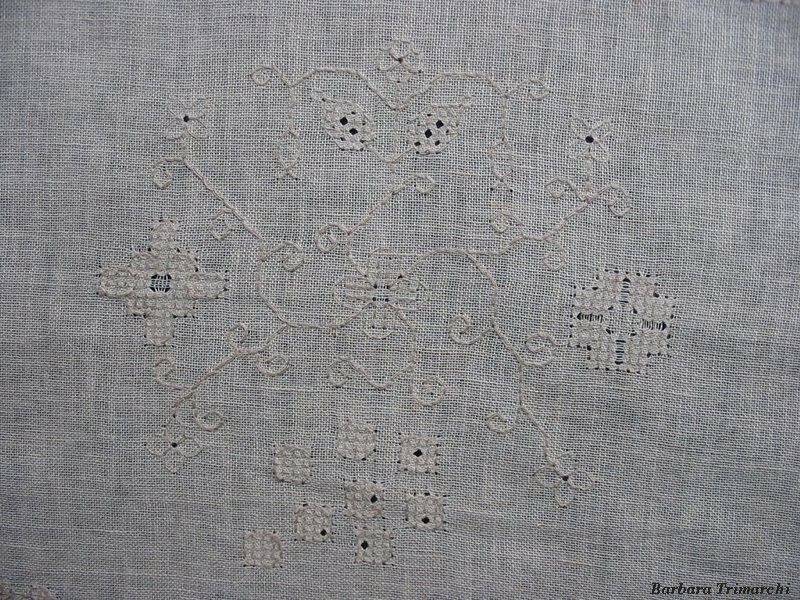 Lots of pictures of embroideries from private and museum collections, some patterns and stitch diagrams as well as historical info. Il Mio Bandera by Gisella Tamagno Gazzola, 2007. (click on her name to go to her website and see some of her amazing work) This book is in Italian and English. It has historical info, stitch diagrams, colour photos of embroideries, designs and instructions on how to carry out some elements. Il Ricamo Bandera, L'arte della pittura ad ago by the Associazione Amici del Ricamo Bandera, 2009. (click on the link to go to their website for some photos and info (some of it in English) This is a small book with lots of colour photos. Most of the text is in Italian but some of the picture captions are in English as well. The Associazione Tradizioni Piemontesi sells kits for cushions, though you'd have to write to them for prices and forms of payment. The teacher Piera Girardi always has beautiful works displayed at the Italia Invita Forums. 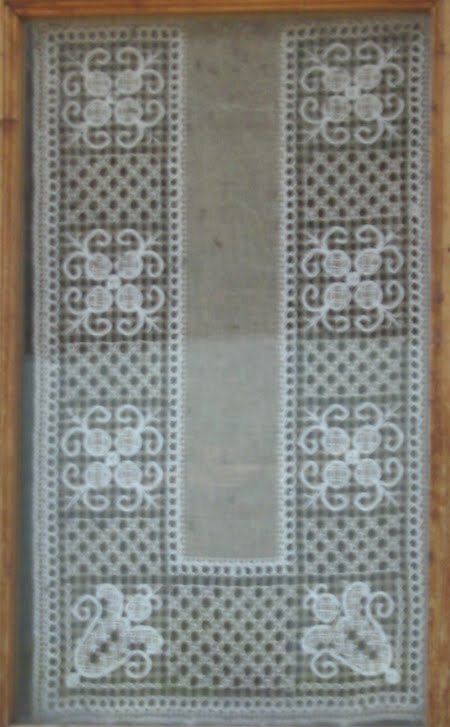 Mani di Fata sells a book of iron-on patterns for Bandera Embroidery with stitch diagrams and ideas for application. Thanks to Giovanna for the photo! As I am trying to figure out how I can afford to go to the next Italia Invita International Lace and Embroidery Forum in 2011 (they have news on their website about events), I have been writing a series of recaps of the previous Forums in 2003, 2005, 2007 and now 2009. My digital camera decided not to work the first night so I have no photos of my own. For this Forum I was able to attend as part of Vima deMarchi Micheli's Italia Mia tour. We arrived in Parma the new location of the Forum the night before the event and I saw many familiar faces on the streets of Parma as we did a little sight-seeing. The theme for the 2009 Forum was "Italian-Style Weddings" and all exhibitors were asked to produce a Bomboniere in their specialty technique. The event was three days, although the first day was restricted to students of the workshops while the public was admitted only on May 9th and 10th. There were 11 workshops which admitted a maximum number of 14 students. Techniques included were: Parma Embroidery, Casalguidi Embroidery, Punto Antico Embroidery, Filet Lace, Aemilia Ars Needle Lace and six courses in Bobbin Laces: Ligurian, Cesena, Rosa del Salento, L'Aquila, Contemporary and Colour Coding designs. You can read more about the workshops here on the old Italia Invita website, most of the links are no longer active but there is still a lot of information on the pages that remain. The major difference between previous Forums and this one was that the group Italia Invita had turned over the actual running of the Forum to the company Fiere di Parma. Parma is a city of exhibitions and this company specializes in running shows. As the event had become too large for the seven women of Italia Invita to manage, this move was logical. There was quite a bit of talk however among Italians about how Fiere di Parma didn't understand the clientele for this particular show. Our group of North Americans however, enjoyed it immensely. The atelier mini-workshops were offered as before, although they had been limited to two per person in total – in 2007 you could take two per day, for a total of six. I debated heavily on signing up as I remembered being totally overwhelmed in 2007 and not retaining much. In the end I couldn't pass up the opportunity to try to learn something and attended one on Puncetto and one on Sicilian Drawn Thread Work. I didn't finish either piece and I can't even find them now to scan them for you. The Forum was situated in one corner of a massive building where an Antiques Market was being held. We had to pass through the Antiques Market to get to the Forum so of course we investigated all the antique embroideries and laces and stitching equipment that we saw along the way. The first day was hot and crowded but everyone's enthusiasm kept us going until we collapsed into bed way past midnight and then got up to do it all over again the next day. The frenzy to see everything was contagious and groups or individuals would meet mid-aisle and grab each other, and literally drag each other off to see something marvelous. I bought without looking. Totally taken up in the conviction that it whatever it was, I needed it and I could look at it later. Even as we gathered to leave, I ran off to buy one last piece of fabric and then had to run to catch up to my group as they were exiting the building. I was sorry that this event wasn't open to the public for three days like the previous one, but then to tell the truth, I couldn't really have fit anything else in my suitcase! This time, instead of leaving clothing behind, I bought a second bag at the outdoor market in Florence which was our next stop on the tour after the Forum. This edition of the Forum saw over 6,000 visitors. The irony? The Italia Invita Forum occupied a small corner of the building while the Antiques Market occupied the rest of what was a huge pavillion. That weekend the reported number of visitors for the two events combined was over 10,000. As before there was a book called Merletti e Ricami Italiani Forum 2009 [Italian Laces and Embroideries]. This book has an article on the history of Bomboniere; photos and information on all 63 Bomboniere; and there are also the designs and/or charts for most of them. Thank you Isabella for the photos of the booths! 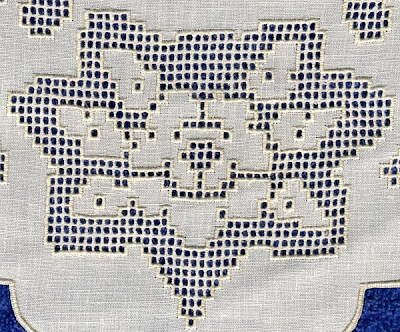 There are a few types of embroidery that take the Italian town of Deruta for their names but today we're going to look at my favourite one called Antique Deruta Embroidery. This Counted/Pulled Thread technique is enjoying a bit of a revival lately as the Accademia Punto Deruta has been studying old pieces in order to recuperate designs, teaching courses and exhibiting pieces in national and international shows. 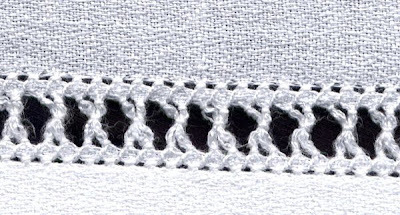 The two basic stitches are Darning Stitch and Double Running Stitch. 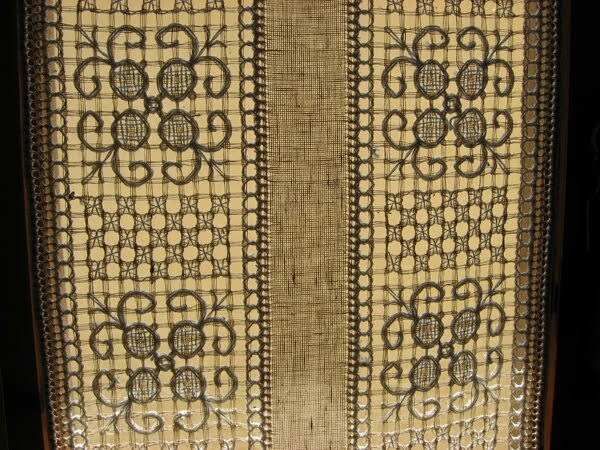 The work is done on openweave fabric called Buratto using 30/2 or 30/3 Linen Thread of the same colour as the fabric. Typical motifs are stylized animals, flowers and vines and geometric patterns. This technique makes particularly great embroidery for curtains as you can really see the designs best when light is behind them or a darker fabric. There is a piece here to look at, and another one here. I took a small atelier 2-hour course at the Italia Invita Forum in 2007. The teachers were fantastic and helped me a lot. It wasn't their fault that I was on information overload by the time I attended the class! There is a certain logic to the path you must follow when doing the stitches in order to end up in the right position and with the right sequence in order to obtain the right effect. 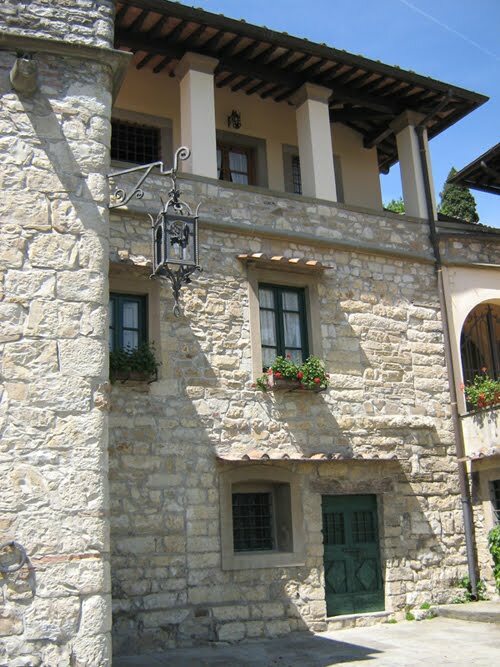 The Accademia Punto Deruta offers tours of their collection but you must make an appointment in advance. 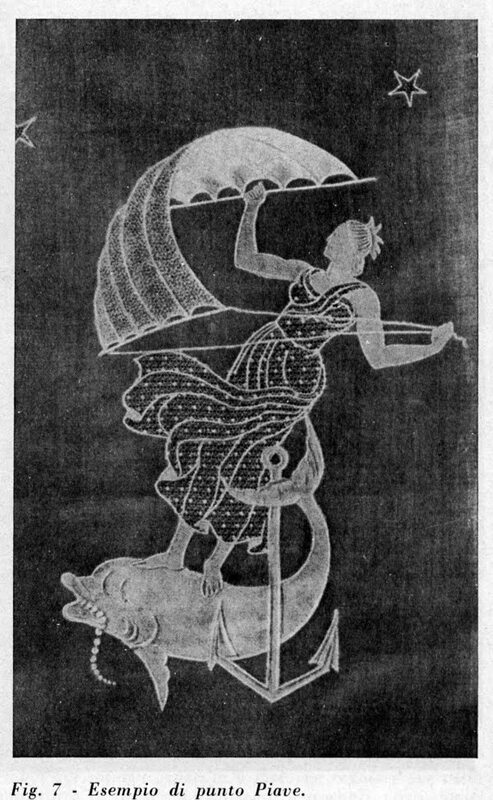 There is a little information on this technique with photos in the Anchor Manual of Needlework, Interweave Press, 1990. Some technical info can also be found in a couple of the Carmela Testa books from the early 20th century - you can find them at Iva Rose. 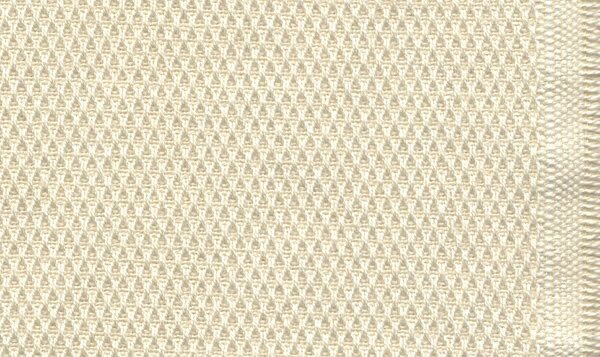 You can get the Italia Invita books and Buratto fabric at Italian Needlecrafts. Over the Accademia Bridge and just a little ways from the Church of Santo Stefano in Venice there is a little shop, Le Burle Veneziane in the Piscina San Samuele no. 3436, which sells hand-made beaded jewelry and accessories. Monica Burcovich is the artist, and she makes some incredible things out of Conteria Veneziana crystals, pearls and tiny glass beads made only on the nearby island of Murano. Taking inspiration from antique Venetian jewelry, Monica keeps this artisan Venetian beadwork technique alive. Every piece she creates is unique and exquisite. Last year I had the task of finding that perfect graduation gift for my daughter. While on tour with Vima deMarchi Micheli, I told her I was thinking about getting some Italian jewelry to match my daughter's graduation dress - a lovely silk taffeta sleeveless full-length gown in cranberry red. Vima said she knew just the place to find something beautiful and original. She knows her stuff! I glanced briefly at it thinking "oh look! A perfect colour match. It can't be this easy, I'll have a look around". The shop is tiny but there are many, many beautiful pieces to look at and I had to go around the room a dozen times before I was satisfied that I'd seen everything. Monica showed us her worktable (located right there in the shop) and the incredibly fine and long needles that she uses to string the beads together. Really the needles look like fine hair they are so thin! How she threads them without going crazy, I don't know! An added delight to learn was that the owner of the shop, Grazia Leone was a costume designer! There was a period costume on a mannequin in one corner. Designing and producing everything from evening wear, to theatre costumes, carnival costumes and even wedding dresses – Grazia's specialty is styles from the periods between 1500 to 1900. The two ladies' artisan activities go hand in hand very well! As I understand it, the shop is well known as a place to rent costumes for balls during Carnevale. As we were leaving I asked Monica about the necklace in the window and said that it was the perfect gift I was looking for but as we had only just started our vacation, I wanted to look around a bit. It still seemed too easy, I really had expected this quest to occupy most of the shopping during the trip. Well two days later on our last day in Venice I still had not found anything to compare. Monica's necklace was made of tiny gold beads with garnet crystals and had a pearl clasp. I could just imagine in laying beautifully on the collarbone of my daughter, perfectly accenting her gown. On our last afternoon I raced back to the shop to arrive just before Monica was closing for lunch. Closing for lunch in Italy can mean anywhere from 2 hours or the rest of the day depending on the merchant. I told Monica that I couldn't stop thinking about the necklace and that the only thing bothering me was that I'd never be able to find earrings that would go with it. As if it were no trouble at all, she said she could make me some over her lunch break. I explained that I had to leave to go to a farewell dinner at 5:30 pm (it was now 1 pm). She told me not to worry and to come back at 5 pm. I was back at the shop at 5 pm and Monica was ready with two stunning earrings to match the necklace. I did not have enough cash however and had to have her draw me a map to the closest bank machine where I ran to get more euros and ran back to the shop. It was almost 5:30 pm and I still had to race back to the hotel to meet the group otherwise I'd miss the farewell dinner as I didn't know where we were eating. Sweating profusely now, I tried my best to quickly and correctly express my appreciation for the beauty of her work and say goodbye to Monica. She begged me to email her a picture of my daughter in her dress with the jewelry on which I promised to do and ran out. Gasping I arrived at the meeting point and enthusiastically told everyone that I had the perfect graduation gift. You can see some of Monica's creations at her website, but only a very few, there is so much more in the shop! There are some more photos at this website along with some pictures of Grazia's costumes.